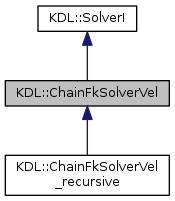 This abstract class encapsulates a solver for the forward velocity kinematics for a KDL::Chain. Definition at line 74 of file chainfksolver.hpp. Definition at line 98 of file chainfksolver.hpp. Calculate forward position and velocity kinematics, from joint coordinates to cartesian coordinates. Update the internal data structures. This is required if the number of segments or number of joints of a chain/tree have changed. This provides a single point of contact for solver memory allocations.